Overnight oatmeal could not be an easier breakfast. Just mix all of the ingredients together, place them in little to-go containers, and let it sit overnight! The next morning you have delicious oatmeal to start your day! Oatmeal breakfast recipes are the best! This delicious fall pumpkin pie version is super easy because you can use pre-made pumpkin pie filling! No need to mix in any extra spices or cook the pumpkin on your own! Of course, if you can only get your hands on regular canned pumpkin, then just add in a teaspoon of pumpkin pie spice to get that delicious pumpkin pie flavor! It's all the deliciousness of pumpkin pie with almost no guilt! The maple syrup is a nice sugar replacement, too! If you want to make this breakfast super nutritious, just add in a scoop of vanilla protein powder and a little extra milk! You can also replace the milk with greek yogurt. You can eat this oatmeal straight out of the fridge, or you can heat it up real quick in the microwave. Again, since it's been soaking, it doesn't need to be cooked. Some days I like this oatmeal hot and some days I like it cold! 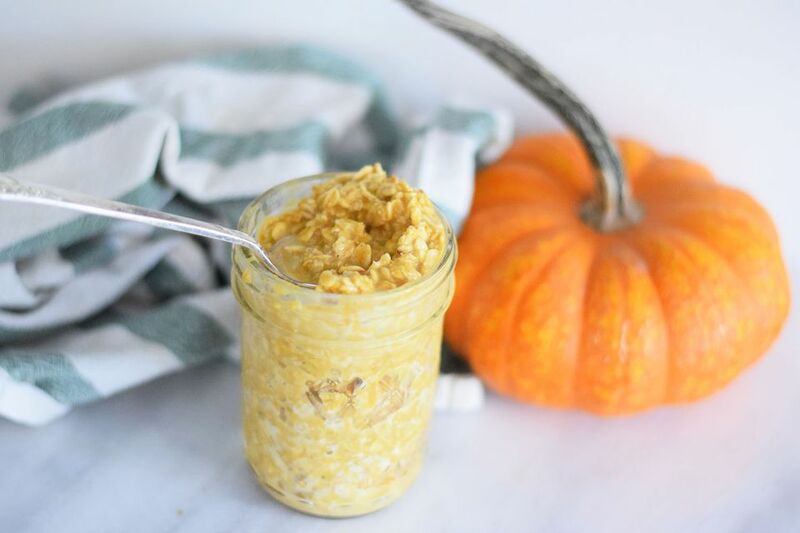 Pumpkin pie oatmeal is super delicious hot or cold like granola! This oatmeal will keep in the fridge for a few days, but I think it definitely tastes the best the first two days. You can easily double or triple the batch to accommodate more people! You can add in other ingredients like 1/4 cup shredded coconut, diced apple, a tablespoon of raisins, a teaspoon of chia seeds, or other healthy seeds like flax. Whisk together the pie filling, whole milk, and maple syrup in a medium sized bowl until smooth and completely combined. Make sure there aren't any lumps of the pie filling. Stir the oats and any of the optional ingredients into the pumpkin pie mixture. Cover the bowl or put it the oatmeal in small glass jars with lids. Place them in the refrigerator overnight, or for at least 4 hours to soften the oats. After it has sat overnight heat in the microwave if you wish, or just eat cold! Oatmeal will keep in the refrigerator for 3 or 4 days.